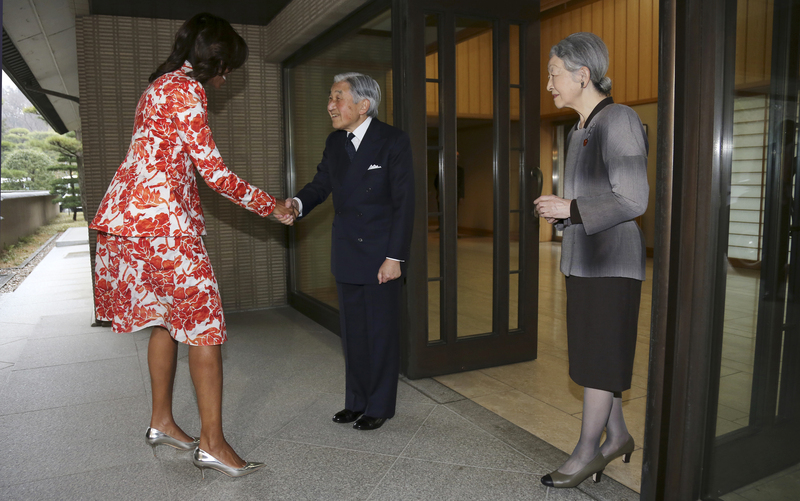 Visiting U.S. first lady Michelle Obama and Akie Abe, wife of Prime Minister Shinzo Abe, pledged Thursday to strengthen bilateral cooperation in helping girls around the world receive an education, especially in developing countries. Obama arrived in Tokyo on Wednesday to push U.S. efforts to give more adolescent girls worldwide access to school and finish their education through an initiative called Let Girls Learn, which was announced earlier this month by Obama and her husband, President Barack Obama. 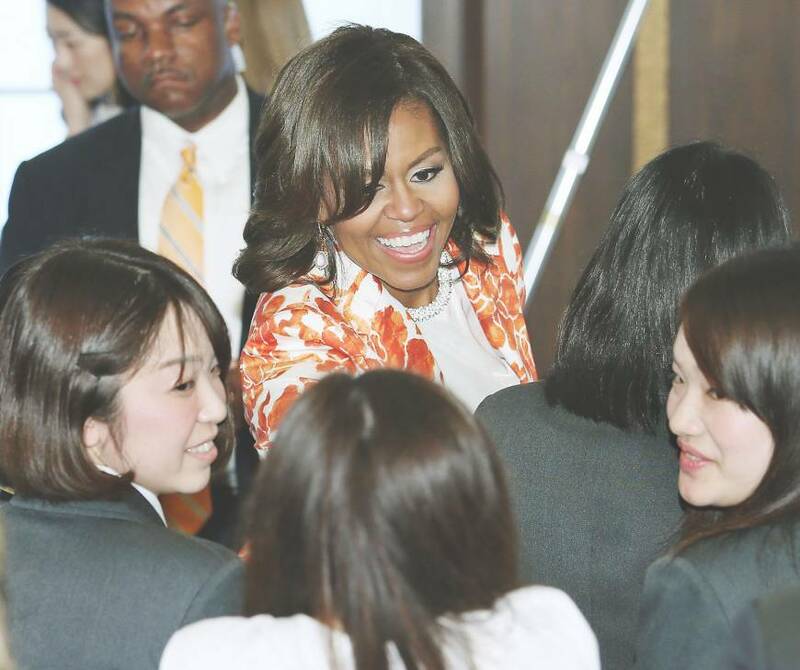 Speaking in front of an audience of 200, including many Japanese female students, at the Foreign Ministry’s Iikura Guest House, Obama stressed the importance of education and said academic opportunities made her what she is today. “That is such a profound waste of human potential. And such a profound loss for our world,” Obama said. Girls who attend school have healthier families and earn higher salaries, she added, and sending more girls to school can boost a nation’s economy. “We know that educating girls is the best investment we can make, not just in their future but in the future of their families, their communities and their countries,” Obama said. 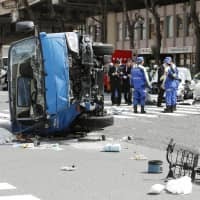 Abe told the audience there are still many children striving to receive rights such as education, which are taken for granted in developed countries. Abe outlined Japan’s efforts to advance education in developing countries through an assistance model called School for All, which aims to improve the learning environment comprehensibly by working with various parties, including schools, local communities and education administrations. 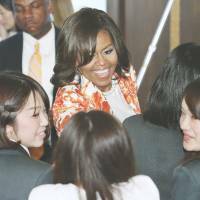 Japan and the U.S. have agreed to partner in the field of girls education, “elevating the issue . . . on their shared development agenda,” according to a statement released Thursday by the two governments. The two countries also pledged to increase efforts to focus on girls’ education in their respective bilateral assistance programs with counterpart governments around the world. 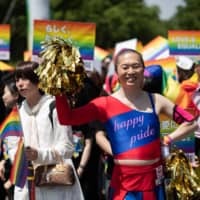 “We will be able to make lots of contributions to the international community if Japan and the United States join together,” Abe said. “I certainly welcome the partnership with the U.S.” in conducting education assistance to the developing countries. Obama called for further international commitment to advance education for girls. 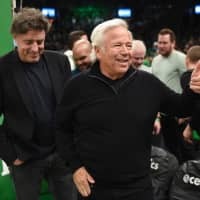 Thursday’s event was also attended by U.S. Ambassador Caroline Kennedy. Obama is making her first trip to Japan. She didn’t accompany the president when he visited in April 2014 as a state guest because of their daughters’ school activities. 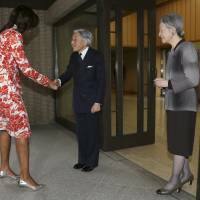 Obama had an audience with Emperor Akihito and Empress Michiko and met Prime Minister Shinzo Abe on Thursday afternoon. She will visit Kyoto before wrapping up her three-day visit to Japan, and will depart for Cambodia on Friday.